You’ve read the books. You’ve searched in the databases. 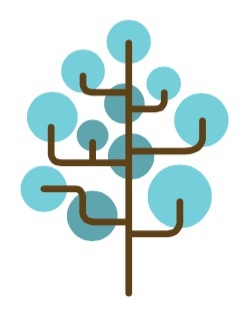 But did you know that one of the best resources in a genealogy library is often the librarian? 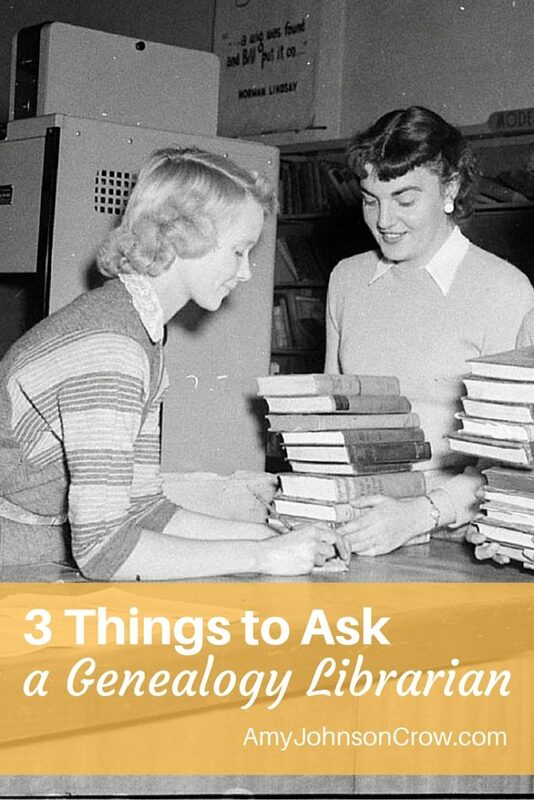 Get more out of your visits to the library by asking these three things. I’ve noticed that there seems to be a hesitation about asking a librarian anything. The reasons people give are often, “She looks busy” or “He’ll think this is a stupid question.” Here’s the scoop: The librarian wants to help you. Yes, she has some work with her while she’s at the reference desk. But when she is at the desk, her main responsibility is to help you. As for the “stupid questions,” I think most librarians would agree with me that the only truly stupid question is the one that isn’t asked. Just because the library has it, doesn’t mean that it’s in the catalog. Things like obituary files, newspaper clipping collections, vertical files, and rare books may not be included. Be sure to ask the librarian about these hidden gems. This is an especially useful question when you have a very specific research focus. 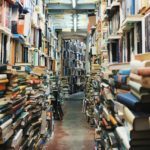 The librarian might be able to point you to those “off the beaten path” places — the tiny historical society, the obscure museum, the church archive — that could have just what it is you’re looking for. 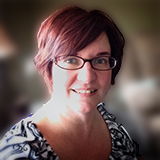 This entry was posted in libraries and tagged librarians, libraries, research by Amy Johnson Crow. Bookmark the permalink. 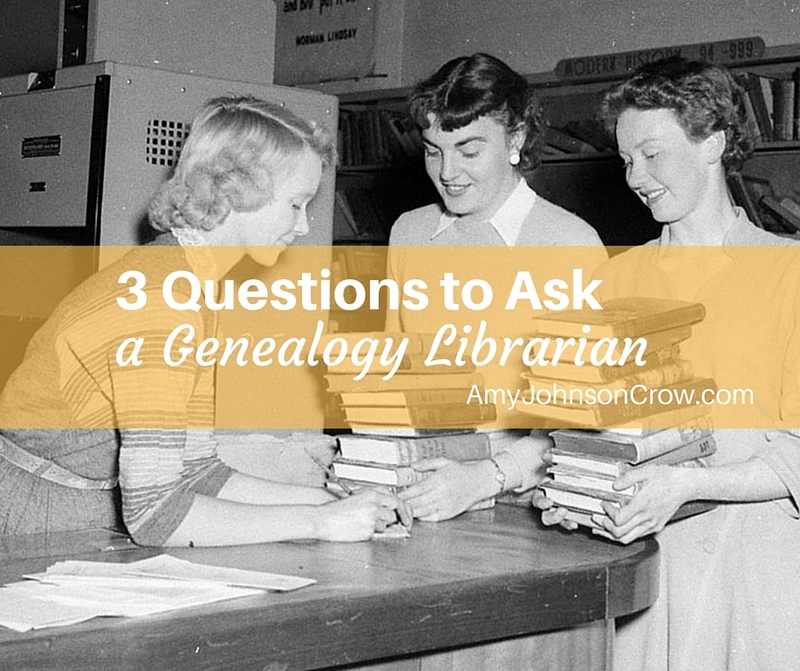 It’s also important to ask other staff who is the Librarian responsible for the genealogy collection. My title is Local Collections Librarian, which a customer might not realize includes both the local history AND genealogy collections. That’s a great suggestion, Elise! Oh, I need to remember #2, asking about collections not in the catalog. Thanks for these tips, they’re so helpful and appreciated! Another question might be, “What can you tell me about this particular resource?” A knowledgeable librarian will know something about resources — how and when they were put together and how to use them. Great advice! 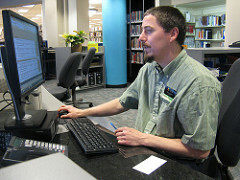 At almost any time, a librarian will be very happy to help you find what you are looking for. There really are no silly questions, we’ve heard them all! Even if the librarian cannot directly answer your question, chances are that they can point you in the right direction. Thanks for sharing Amy! Agree, these are all great questions the librarian is happy to help with! Another one might be to let the librarian know what you’ve looked at and what you’re looking for, and if there’s any other resources in the library you may have overlooked that could be helpful. 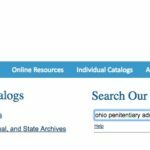 Some resources might not be obvious from the catalog. Thanks for reminding us to utilize our librarians! Librarians, particularly those in small towns, are a fantastic resource. When I need to make an inquiry, the first place I try is the librarian–not the genealogy society, not the history society. The reason is that there’s a good chance that the resources of the society’s are housed in the library. Also, the librarian will know if the societies are active and, if so, who might be the appropriate point of contact. We asked the librarian about resources and she called a 4 th cousin of ours whom she knew. 30 minutes later we met him and his lovely wife. They showed us an old farm cemetery which the great greatys owned and were buried on. New owners for that farm but public access to the ancient family plot. Also a large architectural scroll that one of the great great greats hand wrote with the history of the family and a tree. 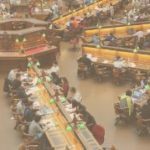 When I was a reference librarian in a large public library, we did hear some stupid questions. “Do you have a recipe for assorted cookies?” was a favorite in the science department. Another science favorite was “How close together do the labor pains have to be when you should go to the hospital?” Yes, the patron was in labor and called the library, not the doctor! But my personal favorite in the history department was one I answered over the telephone: “When was the Magna Carta built and who sailed on her?” I had to put the phone down and go deep in the stacks where nobody would hear me laughing. The I came back to the phone and read the first paragraph of the World Book encyclopedia article on the Magna Carta. She thanked me very nicely. I found a family cemetery in the area where I live that I never even knew I had family here!